Helsinki, home to 600,000 friendly Finns, sits on the shores of the Gulf of Finland in the far south of the country. The country’s location, sandwiched between Sweden and Russia, has played an important role in its history. The Finns have suffered occupation by one or other of its neighbours right up until it gained its independence in 1917. Helsinki was founded in 1550 as a rival trading town to Tallinn, 80km across the gulf in Estonia, and it spent its first two centuries as little more than a quiet market before becoming the capital in 1812. Helsinki is a compact city, and it’s easy to get around on foot. Nevertheless, there is a metro system to carry you around. 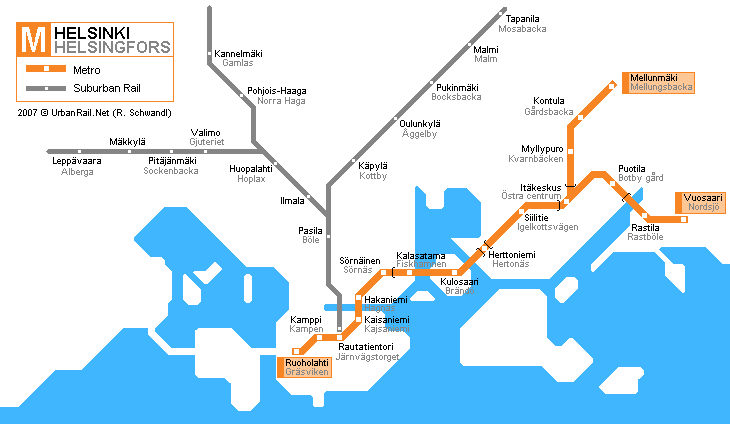 A 48-hour ‘Helsinki Card’, providing discounted entry and free public transport is available from most stations (€49 / £44). Look out over the quayside, Helsinki’s forested islands and handsome Art Nouveau buildings with a ride on the forty metre-tall SkyWheel (observation Ferris Wheel) at Katajanakanlaituri 2 (open 11am-5pm daily, the rides last 12 minutes and costs €12 / £11). Head north from the SkyWheel, cross Katajanokanlaituri and climb the short staircase beside the Finnish flag towards the redbrick Orthodox Uspenski Cathedral at Kanavakatu 1 (10am-3pm Tuesday to Saturdays, 12pm-3pm Sundays; admission free). It was designed by Russian architect Aleksei M Gornostajev with Byzantine and Slavic touches. Continue along Kanavakatu towards the market square (Kauppatori) at Eteläsatamaa. Browse the permanent handicraft stalls, pausing for a warm al fresco coffee and korvapuusti (cinnamon roll) and admire the bronze Havis Amanda statue, the handiwork of Finnish sculptor Ville Vallgren. Cross the road towards the Neoclassical City Hall (Kaupungintalo / Stadshus), originally a hotel built in 1833, and stroll along Unioninkatu to Senate Square (Senaatintori), dominated by four classic buildings designed by Carl Ludvig Engle, notably the white walls and green domes of Helsinki Cathedral (Suurkirkko / Storkyrkan). The menu at Story inside the Old Market Hall (Vanha Kauppahalliat / Gamla Saluhallen) at Eteläranta (open 8am-6pm Monday to Saturday) changes weekly but the salmon soup (a firm Finnish favourite) is available year-round and not to be missed (€13 / £12). Helsinki is a world-class shopping destination. Head to the ‘Design District’, an area of more than two hundred cutting-edge interior stores, galleries and boutiques demarcated a decade ago. Most of the shops can be found along Uudenmaankatu and the surrounding streets. Pop into LOKAL at Annan- kayu 9 (12pm- 4pm Saturday and Sundays), an intimate design store turned coffee shop. The drinking den currently making the biggest buzz is Steam Hellsinki at Olavinkatu 1, a Victorian-themed bar that’s less than a year old. It’s filled with interesting trinkets – antique typewriters, Chesterfield sofas and bespoke metalwork art installations – and its barman and gin connoisseur, Tony, has created a cocktail list with an innovative twist. Try the ‘Chucka-boohoo’ (gin, lime juice and lingonberry jam). The classics are well represented too: G&Ts use award-winning Finnish gin, Napue, served with rosemary and cranberries (from €12 / £11). The interior of Juuri at Korkeavuorenkatu 27 (12pm-11pm Monday to Saturday, 4pm-11pm Sunday) may be bland, with walls painted simply in shades of black, red and yellow, but the food is anything but. It’s in the quiet residential area of Ullanlinna and specialises in sapas (Scandinavian tapas) such as rainbow trout with fermented fennel (main courses from €25 / £22). Alternatively, head to Savotta at Aleksanterinkatu 22 (12pm-11pm Monday to Saturday, 6pm-10pm Sunday). It’s modelled on a cosy wood cabin and serves rustic Finnish fare such as roasted rump of reindeer with Lappish potatoes (€34 / £30). 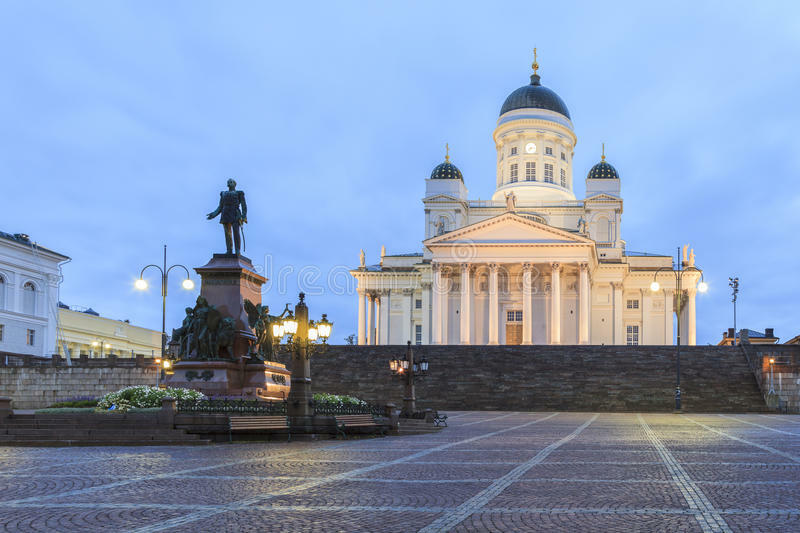 The city’s landmark and visible from almost everywhere is the Helsinki Cathedral (Suurkirkko / Storkyrkan) at Unioninkatu 29 (9am-6pm daily; entry free), a Lutheran church that sits atop a staircase of fifty two steps. Unlike most cathedrals, its interior is simple with just one painting above the altar and only three life-sized sculptures. Directly opposite is Sunn at Aleksanterinkatu 26, a first-floor restaurant with views over Senate Square (Senaatintori) (scrambled eggs with smoked salmon cost €8 / £7). Get a crash course in Nordic design from the Design Museum (Designmuseo / Designmuseet) at Korkeavuorenkatu 23 (11am-6pm Tuesday to Sunday; €10 / £9) or explore the Kiasma National Museum of Contemporary Art (Kansalissgalleria / Nationalgalleri) at Mannerheiminaukio 2 (10am-5pm Tuesday to Sunday; €12 / £11). To the south of the city centre lies Kaivopuisto, the oldest park in Helsinki. Stroll up to the stone remnants of 18th-century fortifications and gaze out at views of the outer islands and cruise liners departing for Stockholm and St Petersburg. The waterfront Café Ursula at Ehrenströmintie 3 (9am-6pm daily) is a nice place to warm up. Order a cup of mulled glogi, served with almonds, raisins and, if the mood takes you, a splash of vodka (€4 / £3). The Unesco protected island of Suomenlinna (open 24 hours) was built by the Swedes as a sea fortress in 1748. It continued to play an important role during the autonomous days when Finland was a Grand Duchy of Russia, acting as a military base. Guided tours are available (€10 / £9) and take place on weekends at 1.30pm. Ferries depart from Market Square (Kauppatori) roughly every forty minutes between 6am and 2am (return from €5 / £4, advance purchase essential). What could be more Finnish than a sauna? The Yrjönkatu Swimming Hall at Yrjönkatu 21 (6.30am-8pm Monday to Saturdays; entry €12 / £12) is one of the nicest and most historic. Men and women are permitted on alternating days and Finns traditionally enter the sauna naked, so be prepared to leave your swimming costumes – and inhibitions – at the door. NICK BOULOS is a travel journalist at The Independent.